Students for Justice in Palestine led a boycott of Israel Fest, an annual festival at the University of Maryland celebrating the history and culture of Israel, on May 2, 2017. 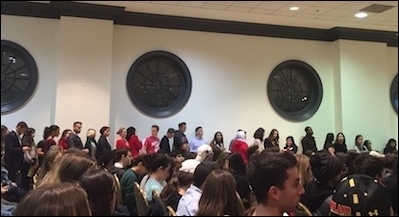 On Wednesday, November 15, the Student Government Association (SGA) of the University of Maryland, College Park decided not to support a resolution that accused Israel of various violations of human rights and which called for the University of Maryland, College Park to divest from a range of American companies investing in Israel. The resolution was introduced by the Students for Justice in Palestine group. It eventually gathered over 200 signatures from students. In response, nine members of the faculty signed a statement in opposition: A second petition opposing the BDS resolution was signed by over 100 members of the faculty, some from Humanities and Social Sciences and a large number from the Natural Sciences and Engineering. We, the undersigned members of the faculty of the University of Maryland, stand against the upcoming Boycott, Divestment, and Sanctions (BDS) related bill being voted on by the UMD Student Government Association on Wednesday, November 15th, 2017 [the bill was introduced on November 8]. This resolution would stifle academic freedom and free exchange of ideas on our campus. It would create a campus climate that would divide the student body, impede productive campus discourse, and potentially isolate the Jewish community. This deceptively straightforward resolution is sponsored by a BDS (Boycott, Divestment and Sanctions) movement that supports the de-legitimization of the State of Israel. BDS rejects any legitimate national aspiration for the Jewish people. The BDS movement repeatedly attacks Zionism and has never condemned attacks on Jewish Israeli civilians. This bill de-legitimizes and promotes misinformation about Israel. This is in line with the broader BDS movement, which singles out the Jewish state – the only liberal democracy in a region beset by some of the world's worst human rights abusers. The BDS movement is hateful, divisive, and ultimately diminishes the chance of peace between Israelis and Palestinians. This bill comes at a time when we see an escalation in hate bias incidents on our campus. BDS campaigns create a hostile campus atmosphere that singles out Jewish and pro-Israel students and subjects them to intimidation, bullying, and abuse. We know that BDS fosters an environment on campus that can lead to anti-Semitism. The initial statement, which I drafted and which was discussed and signed by nine faculty members, made the following points: It was impossible for student representatives who are not experts in the details of Israeli-Palestinian conflict to reach an informed judgment in response to a resolution with a 37-clause indictment in the short time allotted between when the resolution was introduced and when it would be voted on. It would be unfair to reach a judgment by listening to only one side of a very long-standing conflict. 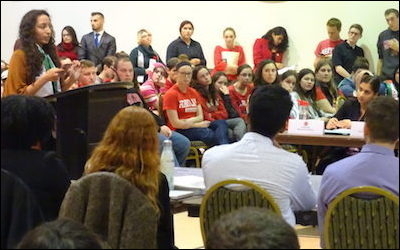 A University of Maryland student makes the case for a BDS resolution that later failed to pass the student legislature. Our statement argued that the proposed resolution was a totally one-sided view of the Israeli-Palestinian conflict. [It] drew "on the language of diversity and inclusion to support a political stance that would exclude Israel from the Middle East. Far from being a resolution that fosters inclusion and diversity, it contributes to an international trend toward authoritarianism and anti-liberalism — for such are the natures of the Hamas and Palestinian Authority governments. (For instance, just think about gay rights.) How does an effort to attack the one Jewish state in the Arab world support the goals of diversity and inclusion?" In our view, the resolution sought to weaken or destroy the bonds between the United States and Israel. Were that to happen, the Palestinian leadership could hope to achieve its goals without compromise, thus undermining prospects for a negotiated settlement of the conflict. The resolution said nothing about terrorism, read as if Israel was not confronted with any threats and treated student representatives as if they knew nothing about the history of the conflict and was counting on that lack of knowledge to make its case. This bill de-legitimizes and promotes misinformation about Israel. This is in line with the broader BDS movement, which singles out the Jewish state— the only liberal democracy in a region beset by some of the world's worst human rights abusers. The BDS movement is hateful, divisive, and ultimately diminishes the chance of peace between Israelis and Palestinians. This bill urges the University to divest from certain companies under the guise of supporting Palestinian human rights, but the legislation ignores the historical context behind the conflict in the region. While we make no claims of Israel's perfection, this bill ignores the vibrant debate within Israeli civil society and undermines the efforts of individuals, Jews, Muslims, Christians, Hindu, Baha'i, and Druze, working on the ground to promote peace. Maryland Senator Ben Cardin (Democrat) and six of Maryland's Democratic U.S. Congressmen also signed a letter to the SGA President in opposition to the BDS resolution. They wrote that such efforts "would only undermine efforts to achieving Middle East peace through a two-state solution." 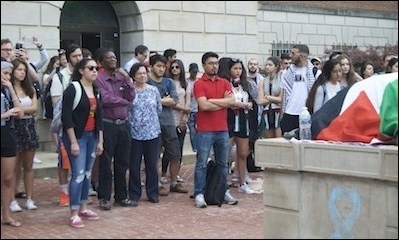 The President of the University of Maryland, Wallace Loh, and the Provost, Mary Ann Rankin, have previously indicated their opposition to BDS efforts. More than 60 students lined up to speak about the BDS resolution. There were indications that many if not most of the 23 representatives voting not to overturn the committee report actually opposed the resolution but voted as they did so that there would be a debate in the full assembly, after which they intended to vote against it. Hence, the overwhelming majority against the resolution evident in the Student Affairs Committee vote appeared to reflect the dominant sentiment of the whole representative body. Some of those who voted in favor of the previous committee reports objected to bringing the resolution to debate before the full assembly because they did not think it was the proper business of the student government to be debating such a resolution in the first place. The introduction of the BDS resolutions into student governments amounts to offering a case for the prosecution which places Israel's advocates on the defensive. As the rules called for a vote within a week, it would have been impossible for them to offer a detailed rebuttal to the array of accusations. The success of such resolutions depends on a rush to judgment based on hearing only one side of a case, an absence of deliberation and an uninformed or easily swayed jury. Students who know little or nothing about the Israeli-Palestinian conflict beyond what they read in BDS resolutions find it difficult to oppose measures that claim to be speaking for diversity and inclusion and against racism and human rights violations. The student government of the University of Maryland should not have a foreign policy. It was impressive to see that many student legislators at Maryland appeared to take the view that the Student Government of the University of Maryland should not have a foreign policy, that the expertise of the student legislators did not extend to assessments of international politics, and that the precious time of this legislative body was better spent dealing with the needs of its campus constituents. Moreover, I interpret the rejection as a savvy reading of efforts of well-organized minorities to use the emotions aroused by the language of diversity and anti-racism in the United States to get student governments to serve their political purposes. The counter-mobilization by Jewish organizations as well as non-Jewish students who opposed such attacks on Israel, evident in the counter petitions and in the remarks of the many who spoke against the resolution, was indispensable. The rejection of the BDS resolution was not only a victory for those of us faculty and students who rejected the substance of the BDS attack on Israel. It was also a stunning demonstration of how a representative parliament can function to foster debate, recognize its proper role and render respect to all of those debating the issue. The passionate views expressed notwithstanding, there were no shouting choruses, hate-filled chants, boos, rude interruptions or threats of violence. All who wished to speak in the allotted time had an opportunity to do so. The legislators treated one another with respect. Because the rules of an on-campus liberal democracy were followed, an effort to bring about a rush to judgment and ram this BDS resolution through the campus legislature failed and failed decisively. While students at some other universities may have proven themselves vulnerable to BDS demagoguery and falsehoods, the deliberative process at our University Student Government presented an insurmountable barrier. The fact that the Student Government representatives reflect the views of a genuine cross-section of the University's 35,000 students also blocked the efforts of well-organized minority of BDS advocates to win the battle. Other university student governments faced with comparable efforts to get student governments to take political positions on the Israel-Palestinian conflict or, for that matter, on any of the dozens of other political conflicts taking place around the world, would do well to look closely at the excellent example of good judgment, counter-mobilization and civility set this past week by both the students and student representatives, and some faculty of the University of Maryland in College Park. Jeffrey Herf is a history professor at the University of Maryland-College Park and a fellow at the Middle East Forum. This article draws on his book Undeclared Wars with Israel: East Germany and the West German Far Left, 1967-1989 (Cambridge University Press, 2016).